Every product on our site includes size measurements towards the bottom of the page to help determine what size you'll need. If you are unsure of what size to order, please review these measurements to determine the appropriate size for your order. We can NOT offer any returns or refunds on an order due to the ordering of a wrong size! The below diagram shows you how to easily read these measurements! For example, you will see that the size spec table will list the "Body Length" & "Body Width" measurements. 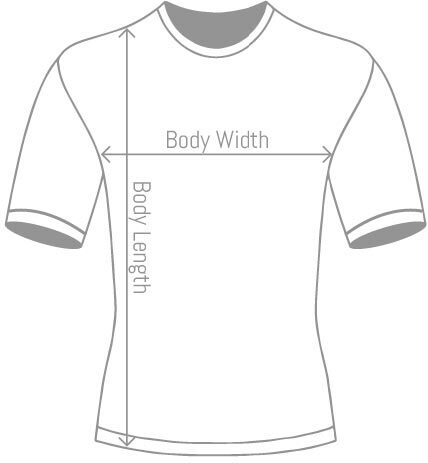 As you can see in the below diagram, the "Body Length" measurement is the distance in inches from the shoulder seam all the way down to the bottom of the garment, the length of the body. The "Body Width" measurement is the distance in inches from the bottom of each sleeve hole, the chest width. **NOTE: Due to the nature of production of t-shirts & apparel, each item does have a tolerance of 1 inch in all directions from these measurements. This is because t-shirts & apparel are usually hand-sewn and there really is no exact science to how these are put together to keep them exact. What this means is while a garment may state the "Body Length" is 28 inches, the actual measurement of it may be between 27-29 inches due to this tolerance. This is a manufacturer requirement so there is not much we can do to change this as we are only a reseller of each brand.